Whew! These projects are never-ending! 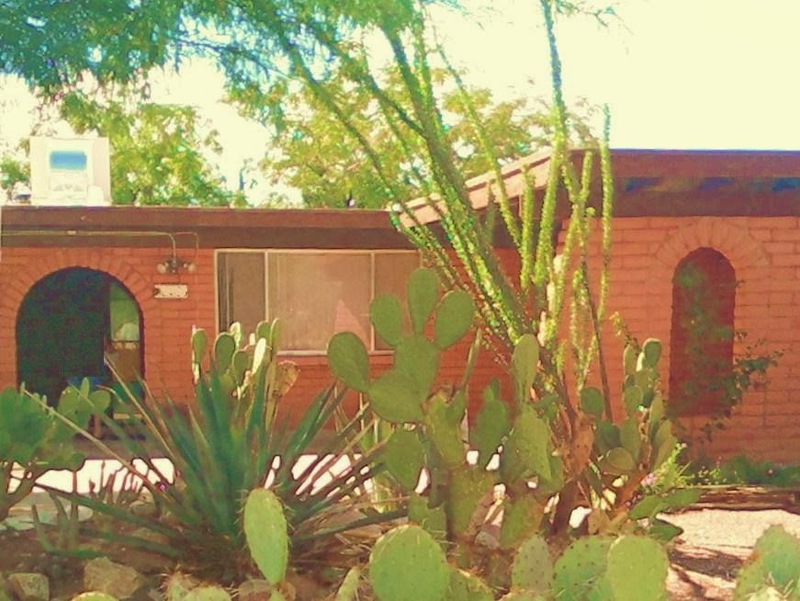 12 more Saturdays until I need to have this place livable. Here are a few photos to get you up to speed. The tools that I ordered online arrived. They are lovely and I already used the nail gun. It's fun! You will be happy to hear that my bucket toilet also arrived. This is for any immediate bathroom needs in the barn-house, not that anyone is moving in just yet. It is super-water saving because it uses sawdust, not water. I cut an access hole in the back bedroom which I am using for storage. It gives me access to the water heater closet. I need to fashion a door to seal it off. The wind tore off the outside door and now rain gets in. When I stuck my head through the hole I saw an angry wasp guarding a nest. Eek. I had to evict them. I need to buy some sort of semi-flexible plastic panel that can be glued in the space and then caulked so water and creatures don't move in. There was a non-functional floor vent in the bathroom. I used a little too much Great Stuff foam. It looked like a loaf of bread. I cut it off and glued a metal sheet over the hole. My niece was brave enough to tackle the roof. 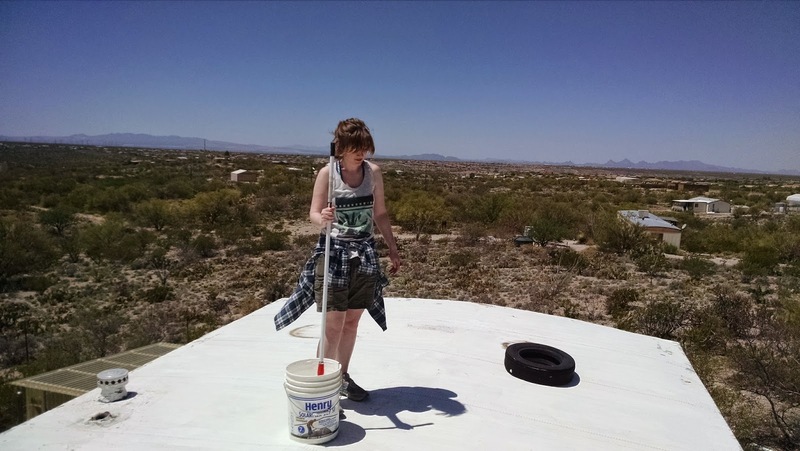 She rolled on elastomeric roof coating until it ran out. I need to buy more this week so she can finish. 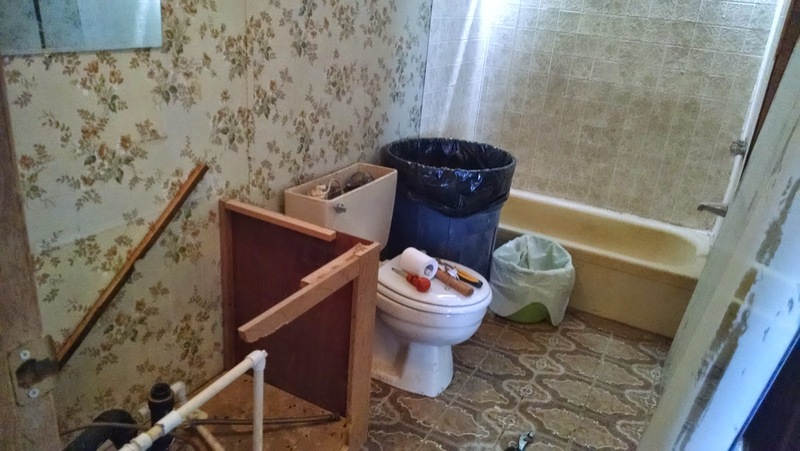 I practiced my demolition skills on the bathroom vanity. It was disgusting and now it is gone. I saved the sink and hope to use it as an outdoor hand washing station eventually. I am running out of money fast so the 1980 wallpaper and paneling will most likely stay. The new vanity will be purchased this week. Nothing fancy, just the basic $50 cabinet and sink from Home Depot. I'm going to have lots of fun figuring out the plumbing. I am replacing the water pump, water heater, and hoping to add some black hose on the roof for solar hot water. 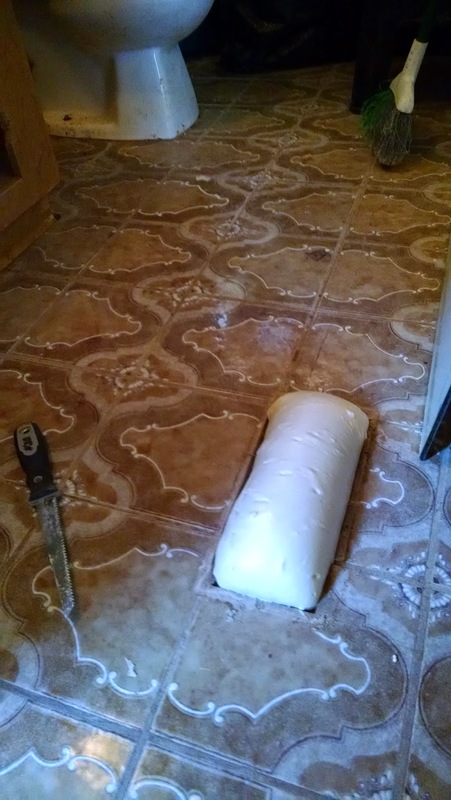 My niece took out the old caulk and scrubbed the bathtub. I looked under the mobile home and it turns out the floor isn't rotted so that is good. 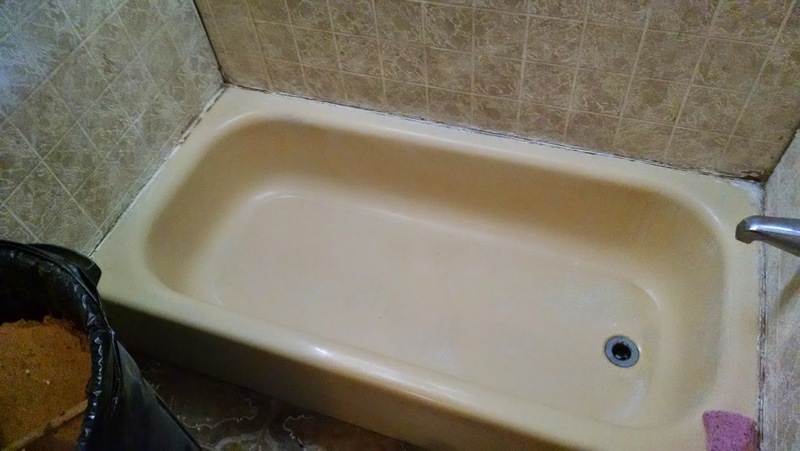 That's right, the classic 80's yellow tub can stay. New caulk is on the shopping list. Those are all the photos from last weekend. The anchors for the barn-house failed. I hired a guy with a jack hammer to sink them but the cable broke and the driving rod bent on the first one. I need a new idea for anchors. And finally, today I got home a little early and I was determined to fix the door lock on my truck. My niece is driving it and it has been very difficult to lock. I've paid for it to be fixed twice but the fixes didn't last. I watched YouTube videos, read forum comments, and a coworker lent me the manual for the truck. 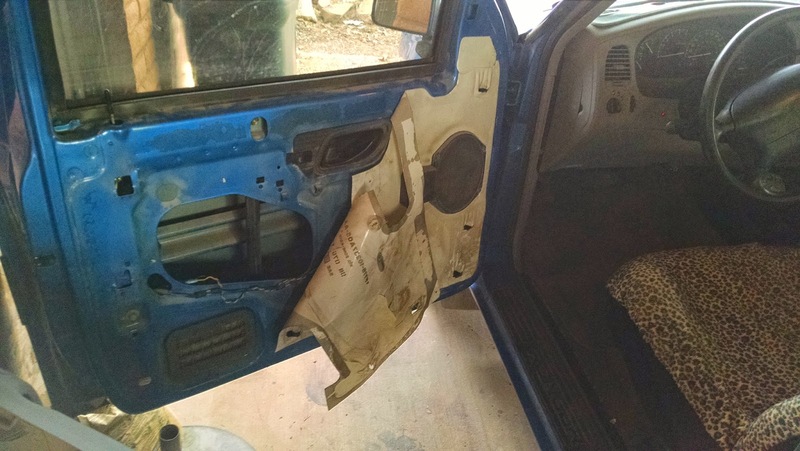 I felt confident that I could get the door panel off and I did it! Then I messed around with the door lock until I found out what was wrong, a misaligned set-screw. I fixed it and put it back together. Hopefully, this fix will last longer than the other "fixes". If not, I know how to disconnect the automatic locks so at least we will be able to lock and unlock the door easily. I am so glad I finally tackled that problem. I am taking a half day on Friday to get a head start this weekend since my niece and I are volunteering on Saturday morning with the water conservation group. That means I need to buy my supplies Thursday evening so I had better get organised. There is so much that needs to be done! Daizy, what a spectacular view from the roof! No wonder your niece wanted to do work up there. How did you safely evict an angry wasp guarding a nest without getting stung? You are quite the wizard. Wow, you're making good strides, Daizy! 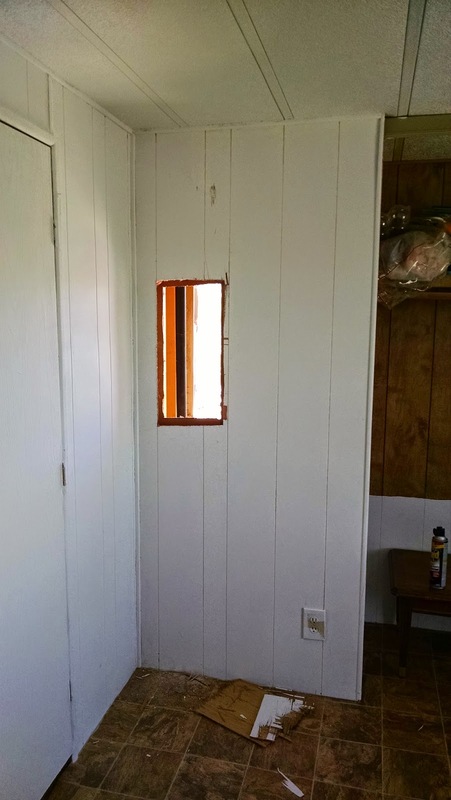 On the bathroom, we've always had good results just painting right over wallpaper and wood paneling. With that pale yellow tub, you could paint everything white, use pale yellow towels and accessories, and have a very clean-style, cheery room! Dave, the view is why I bought the property and yet I have no comfortable indoor space to admire it yet. Hopefully, I will have it soon. "Evict" was a nice way of saying murdered. I had leftover wasp spray from when they were living in the RV hitch and I blasted it. RIP. Lee, painting the bathroom is definitely on my list for future projects. My mother loves the dark paneling and I am only keeping it temporarily since I am short on time. Your idea sounds lovely. The living room is getting paint now because it is such a mish-mash of paneling. The bedroom will have to stay as is. I wish I had the time to fix it all now. Lizzie, it is fun and frustrating and stressful. I wish I had more time to work on it. I could get so much more done if I only had to work at my job one day and could work at the property the rest of the week. I don't think they would keep paying me though. "it is fun and frustrating and stressful"... You wrote this in one of your responses. And I get it cause My Fella and I do most home/RV/yard/whatever projects ourselves instead of hiring a pro. We attempt to figure things out ourselves if we can. Some projects need an expert, but it's amazing to discover what you're capable of. Like taking apart your truck door to fix the lock. Who knew you could do it until you DID IT? As I get older, I'm constantly surprised at the stuff I can figure out how to do... myself! I've never heard of a bucket toilet that uses saw dust. Then again I've never had to look at them. Interesting. That view from where your niece is standing is amazing! kelsi, it is a great feeling when it actually works out. 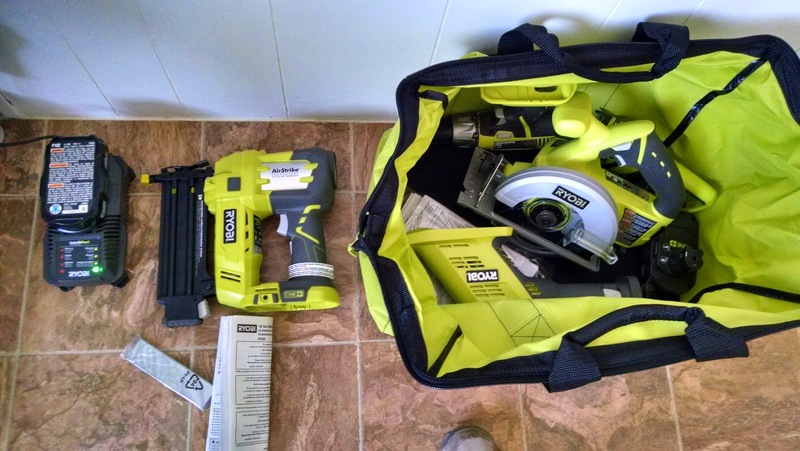 Having the right tools is a big help too. Dobermom, it's can be used with a bag liner with or without sawdust or cat litter or peat moss. 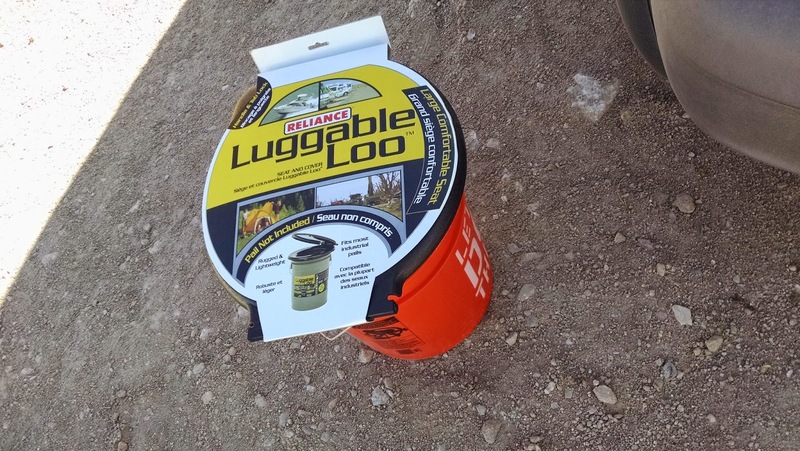 Great for camping instead of having to hike to the outhouse. I have a port-o-potty also which uses water and has to be emptied in to the toilet every few days. Those are just backup since I do have one traditional flush toilet. 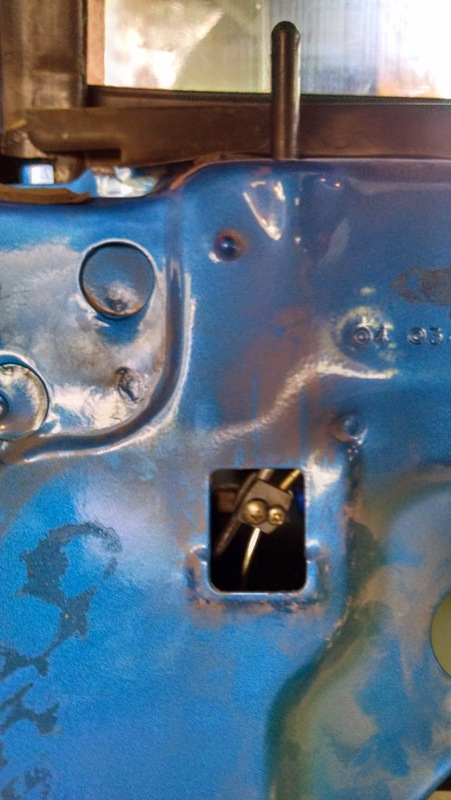 The performance of the door locks have been increased with the keyless entry. Most of us are concerned of the security of our belongings and thus we look for the advance locking systems. With latest development and advancement in the technology there are keyless entry Long Beach door locks available.